Updated strike team white skull!!! 2) Vinyl? Blocks, wedges, etc. would rock! 3) Maybe a crossover with some of the new Bio-Masters parts to get us some red wings!!! That said, Ottman...I'd be 100% on board with your wishes for a white skull strike team. White Skull Sarvos is definitely one of my favorite figures and he's always out near my desk. I'm putting my bets on the new Glyan head being in this drop, along side that, it'll be red and black. This means we're getting a new Cane figure. "Cane, I've been looking for you..."
Wonder if we'll see the original Sarvos mold make a comeback. Plus, it'd be cool to see Tracker, as a Sarvos, come equipped with a belt and a set of Glyarmor to complete the "powered-up" look. Crossing my fingers for a Glyarmored Neo Tracker Sarvos, I'm still curious about when we are going to see the final Govurum head appear...for that matter, wonder if/when we'll get the Varteryx Gotherrus MKII figure. All that aside I'm psyched up for the first release of 2017! And for more lore on the Quallerran's. Also I thought I'd post this here because to my knowledge I haven't seen the Darkness Soldier head in the EMP colorway yet, but got this as a freebie-bonus in October after making a second (or was it third) order for more Glyninja's from the TMNG drop. the head on the left is what I'm referring to, the Neo Sarvos head is just for comparison for color. Could this be a hint of things to come? A third EMP drop this year? or Perhaps a test shot painted and never used? More likely a test shot since EMP was the end of April and the first Darkness Soldier was the end of June. The paint mask matches the Legion soldier that came out in September. I could hope, but not likely. Jealously want one. lol. Well that and a Elite Commando to pop the head on. Witchwitchwitch wrote: Also I thought I'd post this here because to my knowledge I haven't seen the Darkness Soldier head in the EMP colorway yet, but got this as a freebie-bonus in October after making a second (or was it third) order for more Glyninja's from the TMNG drop. 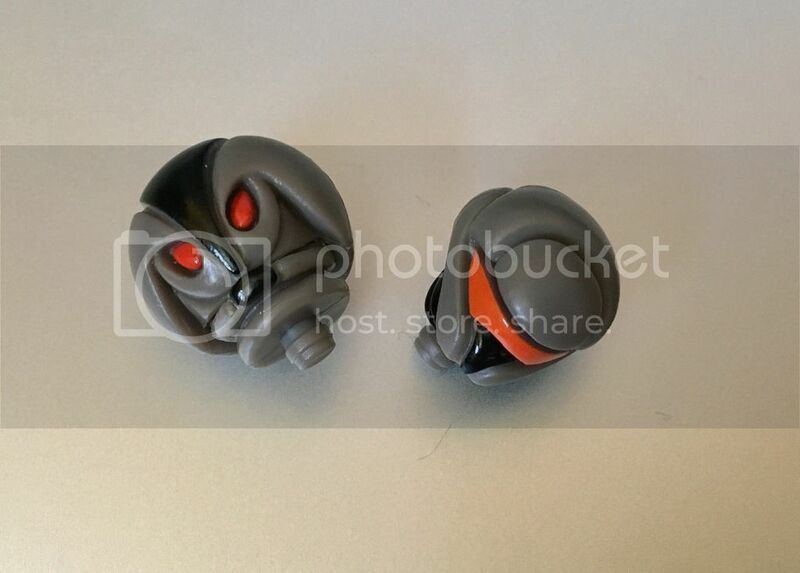 back in the summer Lazzy posted a pic on FB of both the grey and tan darkness soldier heads built up on glyans. it really raised the question of what heads share a mold with what else and are there boxes of darkness soldier heads in other glyarmor colors. Witchwitchwitch wrote: Crossing my fingers for a Glyarmored Neo Tracker Sarvos, I'm still curious about when we are going to see the final Govurum head appear...for that matter, wonder if/when we'll get the Varteryx Gotherrus MKII figure. Thanks for the insight all. And I would love to get a little more Glylore with this drop. Yeah, I'm hoping for a video game or comic. And I'd love to see a larger mix of molds or something new...or old (Delphi?). Maybe we'll see a CC Govurum release like Matt has kind of hinted at? Where did the scar tampo first turn up? It makes me think of Hades even though black/red wouldn't be the colorway for Hades. groovemachine wrote: Yeah, I'm hoping for a video game or comic. And I'd love to see a larger mix of molds or something new...or old (Delphi?). Maybe we'll see a CC Govurum release like Matt has kind of hinted at? Where did the scar tampo first turn up? It makes me think of Hades even though black/red wouldn't be the colorway for Hades. I can second the desire for a new game or comic, that'd be awesome! Looking at the animated gif, it starts as a red "sun" rising, then the Hades Force superimposes over the red and then the "sun" dissolves leaving behind the Hades Force symbol by itself...I wouldn't rule out Hades yet, however it would seem a bit too soon for his return, but what do I know? So, the first drop of the year has generally set the tone for what's to come for the last number of years. I presume this drop will foreshadow what to expect for 2017 overall. 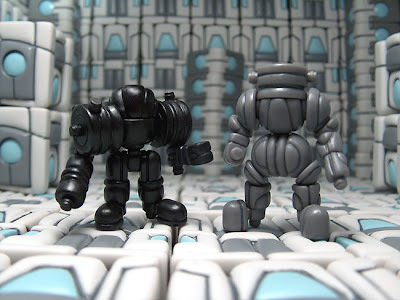 2013 first drop - Sonesidar- first wave of no detail lined figs pushing swappability. 2014 first drop - Gendrone Voyager - showed the first hint at all the awesome metallics to come that year. 2015 first drop - Metran Security Command - introduced us to the Neo Granthans. 2016 first drop - Esedeth Mobile Patrol - paved the way for the real type combos we've seen over the past year. Also, in a way 2015 became the year of the Skeleden armor and 2016 was the year of Glyarmor. groovemachine wrote: 2016 first drop - Esedeth Mobile Patrol - paved the way for the real type combos we've seen over the past year. ...2016 was also the year of the homage, which we got a taste of with a certain Exile in that wave. What will 2017 bring? We will soon get a first glimpse and taste of what's to come! Well, if it's any indication, we just had this posted to the blog, so maybe we'll be getting more "squad" type releases over the coming year? That Tracker, though . . . looks to be a black PVC base with red and grey paint apps. Dang, these figures are getting sophisticated now. From the Knights of the Slice Facebook group: Vector Jump Galaxy Phase crossover figure in tonight's drop. AutoDecept wrote: From the Knights of the Slice Facebook group: Vector Jump Galaxy Phase crossover figure in tonight's drop. that's some RADICAL color and paint apps! 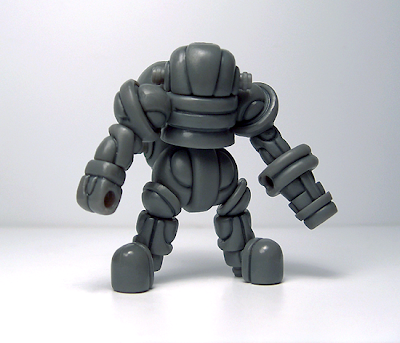 Now the question remains, what will it's Crayboth counterpart look like? Yeah, that KotS is a must have. I guess that answers my question about Sarvos --> Neo Sarvos. Interesting. Everyone probably already knows but drop delayed until 10pm, There is a matching crayboth! I wonder if this wave is a smaller offering of figures, it's seems very strange to reveal so little before a drop. Such an awesome assortment of figures, especially the Tracker and the two Vector Jump Knights of the Slice! Zounds! Got one of every figure and a few parts sets. Hah! Totally missed Pheytron, just read it as a middle-page logo and didn't realize you could buy it. Ah well. Maybe it'll last the hour whatever it is.